ACUTE CHEST PAIN. ACUTE HEART FAILURE. CARDIAC ARREST. TACHYCARDIA. SYNCOPE. If you take care of patients in an emergency department or some other “on-demand” facility, you have to be ready to identify and correctly treat cardiovascular emergencies any time — every time — they present. Learn now from the very best cardiovascular emergency medicine experts in the United States. Every one of the 21 chapters focuses on initial approach and evidence-based treatment — all the info you need right away. Read this book and you WILL save lives. Published by the world’s largest emergency medicine organization, the American College of Emergency Physicians, Cardiovascular Emergencies facilitates the efficient and cutting-edge delivery of care to patients who present with acute cardiovascular conditions. With more than 6 million people presented to U.S. emergency departments every year with chest pain, emergency physicians have the difficult task of differentiating life-threatening causes from more benign ones. And beyond chest pain, emergency physicians care for patients with other forms of cardiac disease—arrhythmias, infections, cardiovascular complications from other conditions, and they must be able to identify these conditions, assess their severity, and provide immediate, often lifesaving, interventions in the less-than-ideal conditions of a busy ED. This book teaches you the essentials of diagnosing and managing cardiovascular disorders from the experts. 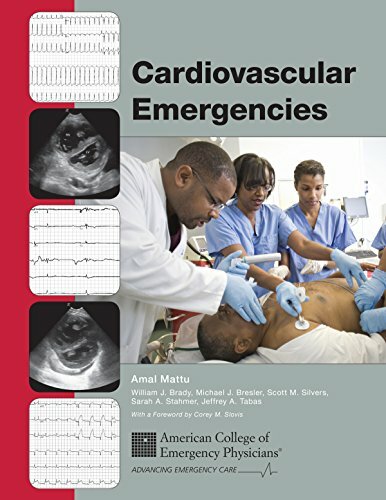 Each of the 21 chapters focuses on an issue of critical importance in the care of patients with cardiovascular emergencies—emergencies that can present in any ED on any day in any community. The book includes hundreds of images, figures, and tables, and key points that you will use every time you treat a patient, brings together highly respected emergency physician educators to teach the essentials of diagnosing and managing cardiovascular disorders.